Hey Pinkbike! First time posting on here but it’s a gooder! 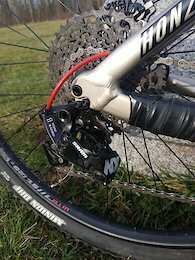 Selling my 2016 Kona Honzo AL DL as my fiancé and I upgraded to some full suspensions. I bought this bike brand new just over a year ago and it was an amazing bike to get myself kickstarted into the sport. With the 29inch wheels, it’s impressive on the descent and climbs with ease. It’s a surprisingly aggressive hardtail for any style of rider. I’m sad to see it go but this bike deserves to be in the wild. Bike is in great condition as it’s been regularly maintained at my local bike shop. Also has some added goodies. Send me a message if you have any questions. Cheers! Specs: Fork – Fox Float 34 Performance (120mm) w/ new stealth decals Brakes – Shimano Deore XT Drivetrain – Shimano Deore 10spd w/ Blackspire Narrow-Wide 28T chainring for easier pedalling Seatpost – KS Eten-I Dropper w/ Specialized Lever Rims – Tubeless ready WTB i29 (front) and WTB Asym 29 (rear) Pedals – Kona Wah Wah ll Composite Tires – Specialized Butcher Grid 2.3 Will include original F Maxxis Minion DHF & R Ardent tires (only ridden on a couple of times), original Race Face 32T chainring, Marsh Guard and bottle cage. If you’re interested in a Honzo but need a large frame, we are selling my fiance’s as well!